The Art of Kara Walker, a “PBS Culture Shock” web activity, tests the participant’s tolerance for imagery that occupies the nebulous space between racism and race affirmation. 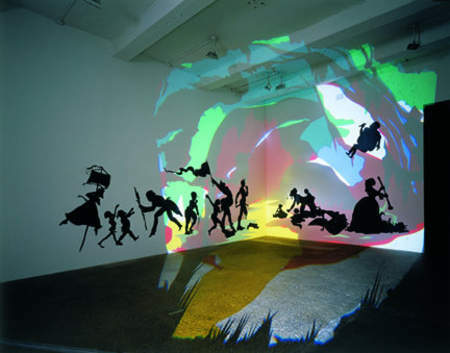 Though the activity gives the participant only two options at the end (whether or not to feature one of Walker’s silhouettes on the “Culture Shock” homepage), the activity explores the multiple and complex reactions Walker’s work elicits. Yet to focus solely on the controversy Walker’s art generates is a disservice to her artistic training and the strength of her art, especially in a stunning and absorbing installation like Darkytown Rebellion. Here, a brilliant pattern of colors washes over a wall full of silhouettes enacting a dramatic rebellion, giving the viewer the unforgettable experience of stepping into a work of art. Walker’s talent is not about creating controversy for its own sake, but building a world that unleashes horrors even as it seduces viewers. In contrast to larger-scale works like the 85 foot, Slavery! Slavery! (1997), Darkytown Rebellion occupies a 37 foot wide corner of a gallery. This ensemble, made up of over a dozen characters, plays out a nightmarish scene on a single plane: one figure stands upright over his severed limb, despite his bleeding leg stump, with bones protruding from his hips; another figure, also exhibiting a severed limb, rolls on his back; a woman with a bonnet and voluminous hoop skirt may be attacking a smaller figure on its back, perhaps a crying baby, with a long, plunger-like instrument. What is most remarkable about these scenes is how much each silhouette conceals. Without interior detail, the viewer can lose the information needed to determine gender, gauge whether a left or right leg was severed, or discern what exactly is in the black puddle beneath the woman’s murderous tool. The color projections, whose abstract shapes recall the 1960s liquid light shows projected with psychedelic music, heighten the surreality of the scene. Walker is a well-rounded multimedia artist, having begun her career in painting and expanded into film as well as works on paper. The layering she achieves with the color projections and silhouettes in Darkytown Rebellion anticipates her later work with shadow puppet films. In addition to creating a striking viewer experience, Darkytown Rebellion reflects on the historical representation of African Americans in American visual culture. From the infamous Brookes slave ship print (1789), to Birth of a Nation (1915) to the Aunt Jemima logo (c.1890-today), powerful visuals shape African-American stereotypes and inform how popular culture perceives this community. Walker is one of several African-American women who use art to engage with and challenge visualizations of race within popular culture; others include Renee Cox, Adrian Piper, and Faith Ringgold. Darkytown Rebellion is also born from a desire to translate the past into visual form. Walker discovered a landscape painting in American Primitive Painting, a book featuring artwork by unschooled artists. One anonymous landscape, mysteriously titled Darkytown, intrigued Walker and inspired her to remove the over-sized African-American caricatures. She placed them, along with more figures (a jockey, a rebel, and others), within a scene of rebellion, hence the re-worked title of her 2001 installation. Through Darkytown Rebellion, Walker is not attempting to correct a late-nineteenth century depiction of African-Americans but rather to broach a discussion: are these merely images from the past or do these caricatures still resonate in the twenty-first century? Walker’s dedication to recovering lost histories through art is a way of battling the historical erasure that plagues African Americans, like the woman lynched by the mob in Atlanta. Though this lynching was published, how many more have been forgotten? Who was this woman, what did she look like, why was she murdered? The impossibility of answering these questions finds a visual equivalent in the silhouetted voids in Walker’s artistic practice. Silhouettes began as a courtly art form in sixteenth-century Europe and became a suitable hobby for ladies and an economical alternative to painted miniatures, before devolving into a craft in the twentieth century. Traditionally silhouettes were made of the sitter’s bust profile, cut into paper, affixed to a non-black background, and framed. Except for the outline of a forehead, nose, lips, and chin all the subject’s facial details are lost in a silhouette, thus reducing the sitter to a few personal characteristics. In Walker’s hands the minimalist silhouette becomes a tool for exploring racial identification. All things being equal, what distinguishes the white master from his slave in Darkytown Rebellion? Walker forces the viewer to confront the visual cues that make up stereotypes: these cues distill human forms into basic and arbitrary shapes that compose the basis of racial discrimination. Though Darkytown Rebellion is full of shapes lacking detail, Walker reserves sharp outlines for faces and limbs. Walker’s silhouettes are (mostly) full-bodied figures, captured in various poses from the traditional profile, to a three-quarter turn, to full frontal. This plurality of poses, often in a single body, is another example of obscured detail within the silhouette tradition: here not only is the face absent, but the body’s action is also ambiguous. As mentioned earlier, it is impossible to make out which leg is severed on the standing figure near the corner, yet Walker manages to give the gory details of that man’s tragedy. If traditional silhouettes illustrated a contained shape, Walker’s figures overflow these boundaries, whether through graphic violence or metaphorically, in terms of subject matter. Darkytown Rebellion does not attempt to stitch together facts, but rather to create something more potent, to imagine the unimaginable brutalities of an era in a single glance. Cite this page as: Dr. Doris Maria-Reina Bravo, "Kara Walker, Darkytown Rebellion," in Smarthistory, August 9, 2015, accessed April 19, 2019, https://smarthistory.org/kara-walker-darkytown-rebellion/.